Please read the announcement below from the Social Security Administration (SSA) and its Office of the Inspector General (OIG) addressing a nationwide telephone impersonation scheme. About 2 weeks ago, I received a call from a man claiming to be a federal agent conducting an investigation involving my social security number. He gave his badge number and proceeded to ask me for information to “validate” my identity. When I declined, he proceeded to verbalize that he was providing my address to the local Sheriff with a warrant for my arrest if I refused to cooperate with his investigation. As a means to intimidate me and show he knew “things” about me, he gave my address and a few other details (which are actually public record details). I continued to decline and said I will address any questions the Sheriff has directly. He encouraged me to get a good attorney as I would be taking on the Federal government. I am happy to report no harm came to me nor was I pursued by anyone. The SSA and OIG announcement confirms that federal organizations like Social Security, do not call consumers. And just because someone claims to be from somewhere, gives a badge number or knows general information about you, do not start giving details like your social security number, date of birth or other personal details. We have included the announcement from SSA and OIG below. 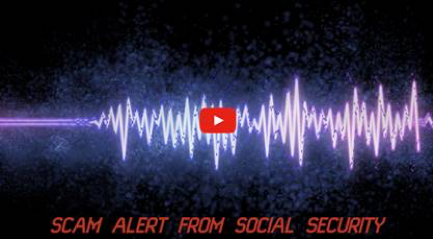 The Social Security Administration (SSA) and its Office of the Inspector General (OIG) launched a joint Public Service Announcement (PSA) campaign addressing a nationwide telephone impersonation scheme. Social Security and the OIG continue to receive reports from across the country about fraudulent phone calls from people falsely claiming to be Social Security employees. Calls can even “spoof” Social Security’s national customer service number as the incoming number on the caller ID. The new PSAs will air on TV and radio stations across the country to alert the public to remain vigilant against potential fraud. Social Security employees do occasionally contact people--generally those who have ongoing business with the agency--by telephone for business purposes. However, Social Security employees will never threaten a person or promise a Social Security benefit approval, or increase, in exchange for information. In those cases, the call is fraudulent, and people should not engage with the caller. If a person receives these calls, he or she should report the information to the OIG Fraud Hotline at 1-800-269-0271 or online at https://oig.ssa.gov/report.